Part one: Damar is outraged that the Dominion is willing to give so much of Cardassia to the Breen, and is further outraged when Weyoun essentially sacrifices an entire order of Cardassian troops. Meanwhile, Dukat (still posing as a Bajoran) continues to manipulate Kai Winn — eventually revealing that he’s a servant of the pah-wraiths. With Worf and Ezri scheduled to be executed on Cardassia Prime (after they were turned over to the Dominion by the Breen) Damar helps them escape, telling them that the Federation has a friend on Cardassia. Back on the station, Winn decides to accept the pah-wraiths — feeling the Prophets have turned their backs on her — and vows to work with Dukat to destroy anyone who stands in their way. Related: There was a World Series on at the time. Or would’ve been had baseball survived into the 24th century. Part two: Worf and Ezri arrive back on the station (having delivered Damar’s message) and a horrified Sisko learns of a Breen attack at Starfleet HQ on Earth. 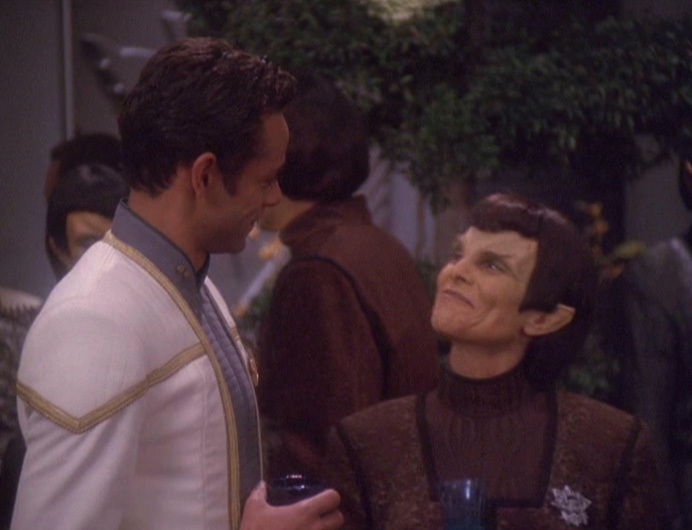 With the Dominion and Breen celebrating, Damar begins plotting against them. Dukat (still posing as a Bajoran) gets Winn to pull some ancient and forbidden texts that are supposed to reveal how to release the pah-wraiths from the Bajoran fire caves (mentioned in “The Assignment”). About this time, Sisko learns that the Dominion is about to retake the Chin’toka system (captured by the Federation in “Tears of the Prophets”) so he takes the Defiant and joins a Federation-Klingon-Romulan fleet to try to stop them. But the Breen employ a new energy-dampening weapon, destroying the dozens of Federation-allied ships, including the Defiant (!) after Sisko and crew manage to escape. Back on Bajor, Winn’s assistant Solbor (James Otis) has figured out who Dukat really is and reveals it to Winn. But Winn doesn’t want to be exposed and kills Solbor with a knife. Blood from the knife touches the previously blank pages of the forbidden texts, providing a way for Dukat and Winn to continue. Back on DS9, Sisko and Ross are freaking out about stopping the Breen when the station intercepts a message from Damar to the Cardassian people, urging them to join his new rebellion. 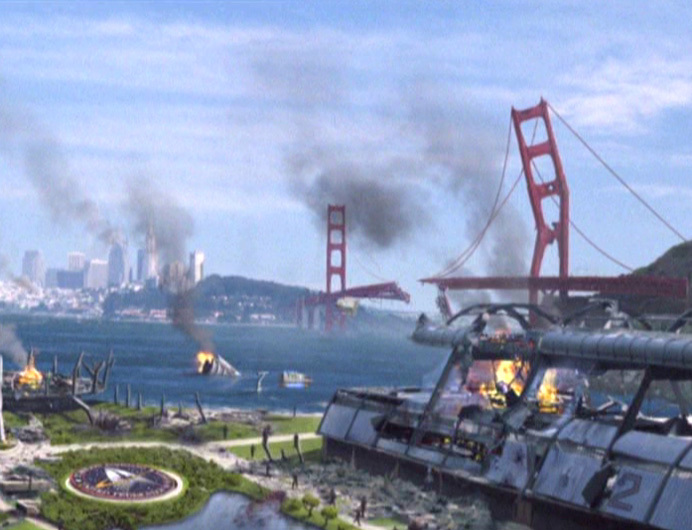 The plot summary really covers a lot of the big items, but the Breen’s attack on Earth and Starfleet HQ is another huge moment in DS9’s final seasons (and in keeping with the not-F-ing-around approach we’ve noted before). Damar formally starting his rebellion is huge — and the furthering of Dukat and Winn’s plan is equally important in DS9’s final arc. I hate Winn’s bold pronouncement in “Strange Bedfellows”, mostly because it seems cheesy and so at odds with her more complex stance in “The Changing Face of Evil”. But oh, well. Now, one thing I’ve never understood. Why did the Bajorans keep the forbidden texts in the first place? For a spiritual people who revere the Prophets — and faith is supposedly what kept the Bajorans together over the years — why not just destroy the forbidden texts? Hell, given that they were essentially being wiped out by the Cardassians for 50 years, it’s amazing that the Bajorans were able to preserve the texts at all. Beyond that, how in the hell did the Breen get all the way to Earth? As far as we know, the Breen have no cloaking technology, so they must have gotten past Starfleet’s defenses before being able to attack the planet. Now, we saw the Borg do this way back in “The Best of Both Worlds”, but that was after they destroyed 40 starships — at a time when Starfleet wasn’t all that mobilized for war. And, finally, it’s just way too convenient that the female Changeling tells Weyoun not to destroy the Defiant escape pods. 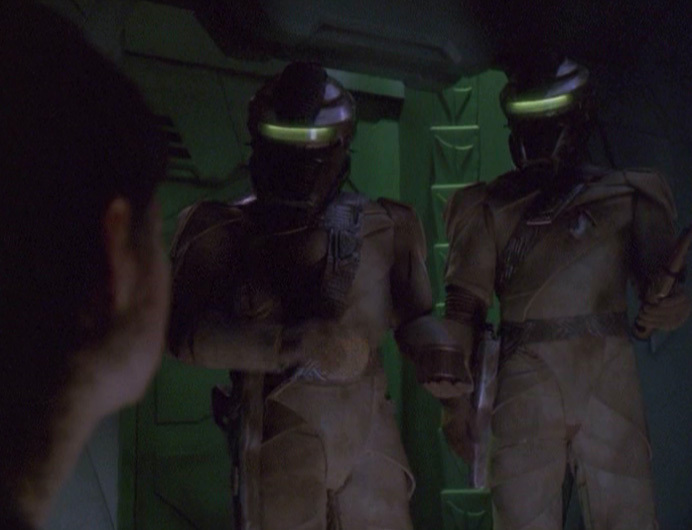 Her reasoning is that the survivors will spread fear when they return and talk about the new Breen weapon. But that information would have been conveyed in one way or another. Honestly, if I were the Founders, I’d do anything possible to knock off Sisko, considering he has a direct line of communication to god-like beings who destroyed 2,800 Dominion ships at one point. 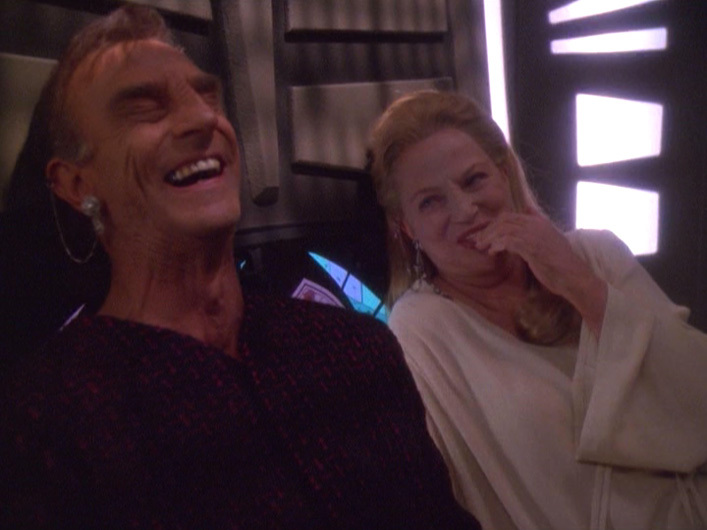 Complaints above aside, “The Changing Face of Evil” is a highlight of DS9, from the destruction of the Defiant to the founding of Damar’s rebellion. In both cases, the DS9 creators showed they were really going for broke, even if they had to do so with some goofy logic (like the escape pod bit). It’s really a credit to DS9 that the final chapter narratives all fit together for the most part, given how many balls were in the air. More final chapter fun, with Gowron donning a dunce cap. Part one: Worf is lost after the Klingon ship he was commanding is destroyed by the Dominion. The Defiant has to call off its search, so Ezri, against orders, takes a runabout and eventually finds him in the Badlands. Quickly, the Jem’Hadar find them and destroy the runabout, forcing Worf and Ezri onto a jungle planet without any means of escape. 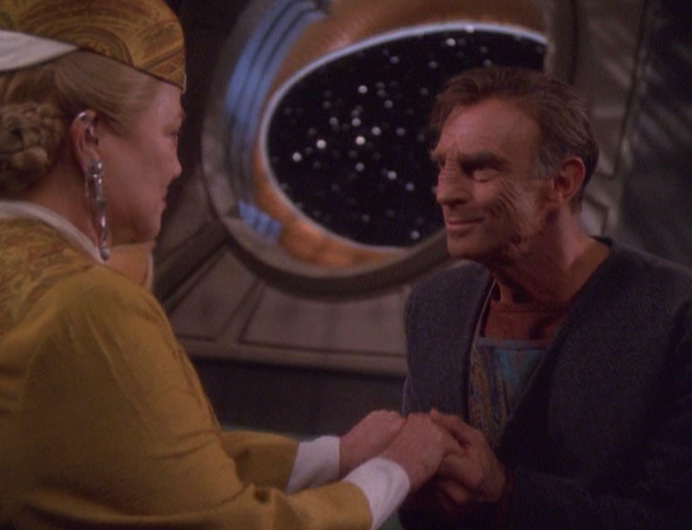 Meanwhile, the female Changeling (Salome Jens) is still in bad health, despite Weyoun’s efforts, and is up to something that she doesn’t want Damar to know about. Back on the station, Sisko asks Kasidy Yates (Penny Johnson) — whom we’ve seen like twice since she got out of prison — to marry him. Back on Cardassia, Dukat shows up asking an embittered Damar for a favor, and later appears surgically altered as a Bajoran. Ezri and Worf, after several days of bickering, end up doing the nasty — only to be caught off guard and captured by some Breen troops. Sisko, back on the station, has a vision where his mother, the Prophet Sarah (Deborah Lacy) tells him he shouldn’t marry Kasidy. Part two: As Ezri and Worf, as Breen prisoners, talk about their feelings, Sisko tries to make sense of what Sarah told him and old pal Kai Winn (Louise Fletcher) shows up to help with the wedding. Then, Winn has a vision from what she believes are the Prophets — but are actually the pah-wraiths — telling her she must bring about the restoration of Bajor, as the Emissary has faltered. Back on Cardassia, a clearly disillusioned Damar provides Dukat (who talks about his embrace of the pan-wraiths) with forged travel documents and Dukat urges Damar to be the leader Cardassia needs. Then, Dukat posing as a Bajoran farmer, shows up on the station and seeks Winn’s guidance, only to make it appear that he is the guide the pah-wraiths told her about. Meanwhile, Sisko has told Kasidy that the wedding is off and Weyoun, the female Changeling and Damar (who is being told less and less by Weyoun) are on a trip for a mysterious rendezvous. Sisko eventually decides to defy the Prophets and has Ross marry him and Kasidy. The episode ends as the Breen turn over Ezri and Worf to Weyoun’s party and Weyoun tells them the Dominion and the Breen are now allies. Well, the big item is the establishment of the Dominion-Breen alliance, which tilts the war back in the favor of the Dominion for a while. While we don’t learn a ton more about the Breen in the coming episodes, we learn more about them than we had in all of second-generation Trek. Other than one episode, “Indiscretion”, back in season four and that one dude in the Dominion prison camp, the Breen had only really been mentioned in previous episodes. They were sort of the Dr. Selar of aliens up until this point (seen briefly, mentioned as filler dialog a lot). We also see more of how Damar is disillusioned with the Dominion. His actions later in the final DS9 arc will be as important as any other character — but more on that in our next review. And, of course, there’s Dukat and his manipulation of Winn that will lead to the ultimate showdown with Sisko at the end of the series. More on that in the next several reviews. I have a real problem with the Kasidy storyline. Nothing against the character or the actor. But it bothers me that a character who clearly hasn’t been that big a part of Sisko’s life (based on everything we’ve seen on screen) would suddenly become so important that he’d defy the Prophets’ warnings. Think I’m being overly critical? Consider that Kasidy showed up in five episodes since she was tossed in the big house after helping the Maquis back in the fourth season. She shows up once in the fifth season, twice in the sixth and then twice in the seventh (both of which are inconsequential nonsense episodes) before the final arc. What’s missing is where she was after showing up in the fifth season prior to the Dominion taking the station (was she on Bajor the whole time?) and where she was while Sisko was on Earth for three months trying to reconnect with the Prophets (shouldn’t she have been around to help him through everything, or at least been mentioned?). Did she go out for cigarettes, or something? The question of where she was while Sisko was on Earth is particularly egregious as we know she was still heavily involved with Sisko based on her appearance in the episode right before Dukat killed Jadzia and cut off the Prophets from Bajor. At least, in the fifth season, you could argue that maybe she and Sisko had a cool-down period after she showed up in “Rapture” and before the Dominion retook the station. There was a really quick way of fixing this, by the way. All the creators needed to do was insert some vague line of dialog in “Penumbra” about how Kasidy or Sisko is happy that they stayed together despite all the “ups and downs,” or some similar language. Instead, making Kasidy so important to Sisko here — despite her absence at times when she shouldn’t have been absent — is really sloppy. It’s Voyager-level continuity, to be blunt. Otherwise, these two episodes have too much annoying Ezri/Worf prattle — but at least that situation is mostly resolved by the end of the second episode. And I do find it odd that it’s so easy for Dukat to make it onto the station and not be detected as a Cardassian. But, oh, well. We’ll be reviewing all eight of DS9’s final episodes, but in two-episode chunks where appropriate. When it’s all said and done, there will likely be more DS9 episodes reviewed on this site than any other series, as a result of the serial nature of the show and the ambition of the creators. Despite the Kasidy ridiculousness, there’s a lot of good stuff here, but my favorite storyline is the one involving Damar, who becomes one of the show’s most complex characters. That’s fascinating, given his introduction as a glorified extra back in “Return to Grace”. The creators lucked out that Casey Biggs was up to the challenge. Lastly, it’s weird that Kasidy mentions how her mother would want her wedding to be presided over by a minister. It’s a quick throwaway line, but it’s really strange, considering there’s been no evidence of organized religion for humans since TOS (and even then, most of the references in Kirk’s time were vague). Gene Roddenberry, of course, was a known atheist. The line was typical of late DS9, however, when the evolved-and-advanced humanity trope of TNG sort of was kicked aside even on small details — like using Earth days of the week on a space station with 26-hour days and the increased use of 20th-century culture even among the station’s non-humans (Odo and Kira embracing Vic Fontaine, etc.). The final arc continues — and the Breen make things more interesting. It’s not Section 31 protocol to watch people sleep… that’s just something I like. 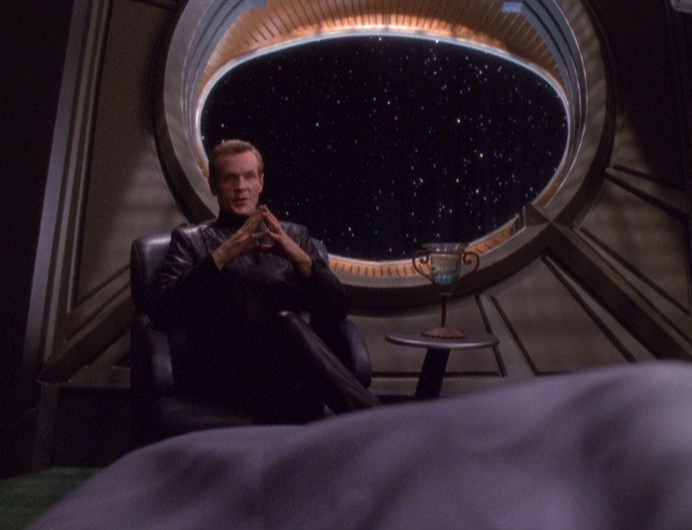 Bashir readies to attend a conference on Romulus, when our buddy Sloan (William Sadler) from “Inquisition” shows up with an assignment to have Bashir gather intel. Sisko (after conferring with Admiral Ross) tells Bashir to play along to try to expose Sloan’s Section 31. What follows is a twist-heavy episode that’s rather hard to explain succinctly, but it turns out Sloan was working with Ross to protect a Starfleet operative within the Romulan ranks and get him promoted in the process. Senator Creetak (Adrienne Barbeau) whom we met (played by a different actor) back in “Image in the Sand” and is now buddy-buddy with the DS9ers (hmmmm) must be sacrificed in the process, and Ross’s willingness to work with Section 31 shows how much Starfleet has been rattled by the war. Sloan, made to look killed during the charade on Romulus, appears at the end of the episode, thanking a defeated Bashir in his quarters. Any thought that Section 31 was less than it was made out to be in “Inquisition” is pushed aside here. 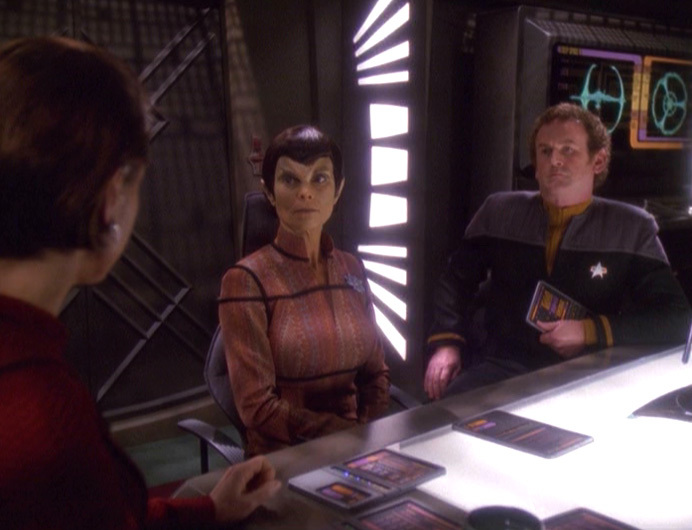 Sloan is able to get to one of Starfleet’s top admirals in Ross and can get himself on a delegation to Romulus. Thematically, this is another example of the DS9 creators not F-ing around. Meanwhile, the Federation-Romulan alliance continues after this episode. Whether that was a result of Sloan’s master plan, it’s important in the eventual end to the war with the Dominion. Sloan’s plan is rather crazy. I suppose it makes sense, to a point — he relied on Bashir’s goodness and lack of options to rope in Creetak, thus making Koval (John Fleck) look better in the eyes of the Romulans. But what if Creetak hadn’t agreed to commit treason? Or, what if she hadn’t been caught? Beyond that, wouldn’t Ross need to really be sure of the plan in order to participate — and given the craziness of the plan, wouldn’t he have backed out? Oh, and as mentioned in a previous review, it’s odd that Creetak and the DS9 crew are cool in this episode — Bashir almost thinks of her as an ally — given her shenanigans earlier in the season. Considering that a different actor plays Creetak this time around, it’s too bad the creators didn’t just make her a new character. The new character could have replaced Creetak and established herself as more trustworthy. I guess Bashir didn’t read Kira’s reports from the whole blockade thing in “Shadows and Symbols”? Now that we’re all friends I imagine nothing bad will ever happen to me. This is probably DS9’s most Ronald D. Moore episode, which is amazing in that it doesn’t involve the Klingons. It’s well-written … if you accept a few conceits, like the ones mentioned above about Sloan’s plan. 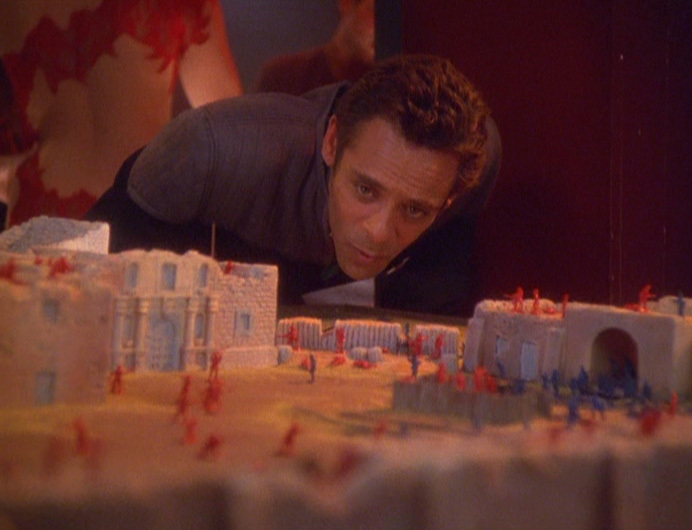 The initial scene between Sloan and Bashir in Bashir’s quarters, in which Sloan outlines what will happen when the war ends and Bashir reacts in disgust, is priceless. Also, this episode has some great callbacks to TOS — Sloan’s use of the “UFP” abbreviation, Bashir using the term “Romulan Star Empire”, which hadn’t been used as far as I can remember in dialog since “Balance of Terror” — that are both vintage RDM. 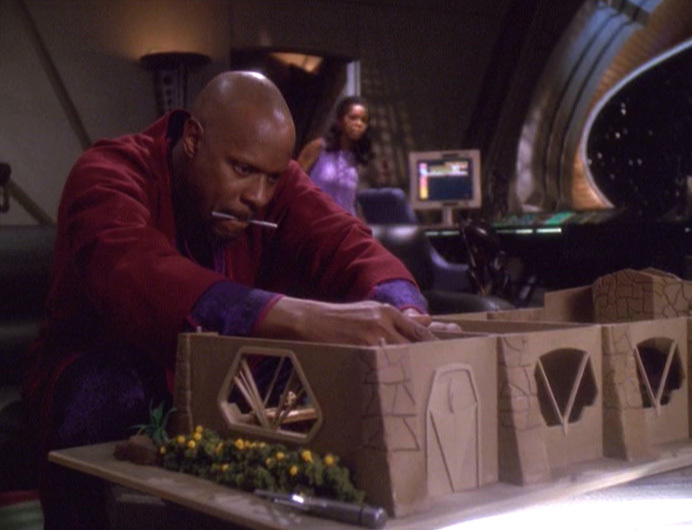 It’s also nice that Moore gave Ross something interesting to do in a way that also keeps Sisko’s hands clean. Barry Jenner had played the role in a rather dull way for more than a year, but this episode gives him something to do for once. It’s also kinda cool that the episode is largely set on an Intrepid-class vessel (which takes the Federation delegation to Romulus) allowing us to see another ship like Voyager. I know it was likely done to save money, but it was cool. I often wondered why we never saw Intrepid-class ships (or Sovereign-class ships, like the Enterprise-E) in any battles with the Dominion.